The history of the Saddam Hussein's poison gas attack, with the complicity of the West, in the working class stronghold of Halabja. On March 13, 1988, the city of Halabja in Iraqi Kurdistan was almost completely destroyed by the Iraqi armed forces using chemical weapons, supplied by the West. Around 5,000 people were killed at the time and many more more died from their injuries over the next few weeks. 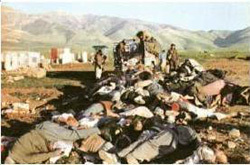 Halabja was not chosen arbitrarily as the site for such a massacre. It had been a major site of proletarian struggle against the Iran-Iraq war - in which the US had backed Iraq. There was at least one deserter in every house, and sometimes four or five. The following is a summary of translations of letters and articles we have seen, written by comrades living in Halabja before and during the massacre. As the account speaks for itself, we see no need to elaborate. During 1987 the Iraqi government destroyed 45 villages around Halabja, using explosives to completely demolish all the houses. The inhabitants poured into Halabja, swelling the population to around 110,000. Almost all the young men in these villages had been deserters from the army. They were not just dropping out of the war but were always discussing ways of doing something against it. The influx of people led to a severe housing shortage and there were no jobs for most people. Shops were selling virtually nothing apart from maybe rice and bread - fruit, vegetables and meat were far too expensive for most. All the time there was talk amongst the unemployed about what to do about the war. Only the rich wanted to fight for their country. Many people were selling their possessions because of the insecure conditions. This enabled the rich to get richer by buying people's TV sets, fridges, etc. and selling them in other cities. The only sizeable bourgeois political organisation taken seriously by the deserters was the Iraqi Communist Party (CP). All the other organisations and parties, in particular the Kurdish nationalists (the largest of which was the Kurdish Democratic Party), were totally discredited because of their open collaboration with the state. Both the KDP and the CP tended to tail-end everything the deserters did. The CP, however, had greater credibility because it gave more support to the deserters than anyone else and was the only organisation to say that sooner or later the government would attack Halabja and that people had to prepare for this. The CP needed to wipe out the bad reputation it accrued by joining the Ba'athist government in 1974. There were also dozens of small organisations, many claiming to be communist, with names like "the Marxist Leninist Workers' Party" , "the Leninist Marxist Group" , etc. etc.. They produced lots of leaflets and graffiti on walls. Someone living in Halabja produced a pamphlet about the condition of the deserters which was very critical of the Kurdish nationalists. A week later he was killed. The place was in chaos. The "traitors and troublemakers were all going around legitimately within the structure of pro-government organisations. H. had a gun, as well as valid documents. Can you believe it?" a) Clan Armies - Around Halabja there had traditionally been five main family/tribal groupings and many more small ones. During the war the feeling of belonging to one clan or another had become much stronger amongst the population. The government set about trying to integrate deserters back into the armed forces of the state by paying clan leaders (big land owners who had become capitalists) 50,000 Dinar per month plus lots of weapons, flash cars etc. to round up deserters from their own clan and put them under military discipline. There was very fierce competition between the clan armies as the leaders vied for more "recruits" and thus more money from the government. This led to many gun fights on the streets, and even in cafes and shops. When people spoke about "war" in Halabja they meant the wars between the clan armies, and between the latter and the deserters, not the war between Iran and Iraq. b) The Home Guard - This was by far the largest army. It was not uniformed and had very few weapons. It was the army that deserters joined purely because there was a law that everyone who had deserted had to have ID saying that they had joined an army. The Home Guard can be seen as a way of legalising desertion in the same way as the "Right to Strike" legalised the strike weapon. S. Hussein even spoke about a "Right to Desert ". c) The Bounty Hunters - This was a small force which acted with extreme viciousness on behalf of the state. Their main function was to force deserters to join the Home Guard. They were always checking people's ID and had a legal right to kill anyone who didn't have any. They were paid 1000 Dinar for bringing someone to a police station alive, and 500 Dinar for their head. They killed a lot of poor people just to get money. They might take someone's head to a police station claiming that they had killed him at the border and that he was a Pasdar (Iranian Revolutionary Guard). After the massacre most of these scum went to Iran to do the same job for the Iranian state. There were very close links between the leaders of the clan armies, the bounty hunters, Kurdish nationalist organisations and local businessmen. All the talk about stopping the government from destroying Halabja turned to action on 13 May 1987 when militants occupied the mosques and used the loudspeakers to call for the organisation of an uprising. Mosques were used because they were the most suitable buildings in which to hold mass meetings. This was ironic because for weeks before the priests had been giving a special talk after each Friday prayer meeting on... the evils of communist subversion! Almost the whole working clan population of Halabja was awake that night discussing and organising. Many people had weapons; these were mostly those who had been in the clan armies (double deserters!). All ages were involved and women as well as men. Everybody was saying "The soldiers are our brothers it is Saddam who is the enemy!" . Iraqi Army troops came to Halabja. They said, more or less, "We've been sent to kill you but we won't do it. But please disperse." The crowd refused to disperse and persuaded most of the soldiers to join the rebellion. "... in May the governmental forces were toppled. The people had taken over and the police and army had to go into hiding, only being able to move around in tanks and in armoured divisions. Helicopters circled overhead, calling for calm and care in the face of the enemies of the nation. Battles were raging near the town, and the Iranians were getting nearer. The town was bombed by Iranian artillery and there were many casualties. Everybody was aware of the danger but were in favour of neither the Iranians nor the Iraqis". The helicopters were accompanied by tanks. Some of the rebels fired at the tanks, then the helicopter fired rockets into the crowd. People fled. Jordanian troops then invaded the town killing hundreds of people. A few days later 200 people were rounded up, some dragged from hospitals, and buried alive. Five days after the rebellion had started the government totally destroyed the area where it had happened. They also booby-trapped empty houses nearby leading to many more deaths. Many people fled to Iran in small groups but the Peshmargan (Kurdish nationalist guerillas) tried to stop them from leaving, saying they would 'liberate' Halabja. This didn't stop the nationalists helping rich people and mullahs to leave, in return for money. Every day helicopters came to tell people to be calm. They said Halabja would not be destroyed. Over the next few weeks there were rebellions in 4 or 5 other Kurdish cities. The government closed the mosques and cut off their electricity to stop then being used like they were in Halabja. The governor of Suliamania (the nearest big city) came to Halabja and made a speech. He said: "Halabja is one of the cities in Iraq which has made many sacrifices throughout history. President Hussein himself has a special concern for Halabja and the people who spread rumours about Halabja being destroyed are your enemies and enemies of the state." Someone in the crowd shouted "What did you do with those 200 people, we want them back!" . The governor said "Goodbye, see you next time". Shortly before the massacre, deserters took over Sirwan (a town about 20 km from Halabja) using weapons from the clan armies. No Kurdish nationalist organisations were involved but the CP was to some extent. Soon afterwards, the Iraqi Airforce totally destroyed the town with bombs and rockets. Two weeks before the massacre clan leaders and army officers were secretly moved to Suliamania. Iraqi soldiers suspected something was up and many gave away their arms to deserters in the streets before fleeing to Suliamania. Many poor people were trying to leave for Iran but the Peshmargan sent them back, as before they helped the rich. Shortly before the massacre Halabja was bombed for three days by Iran and then occupied by the Pasdaran. The Peshmargan helped direct the Iranian bombing (perhaps because they wanted to get rid of the Iraqi military) and after the occupation helped the Pasdaran to keep everyone in Halabja. At the same time they moved their own families to Iran. On 13 March 1988 chemical bombs were dropped on Halabja. No Pasdaran nor Peshmargan were killed. The Iranian soldiers had left on the day before or on the morning of the massacre. The Peshmargan continued to surround the city. Some had gas masks. "We ran over to the basement on the opposite side of the street to take cover. Half an hour later the planes came back from all directions - there must have been at least twenty of them, believe me - and in a few minutes Halabja was in ruins. Shortly afterwards we smelt gas. It was just like the smell of garlic. Some of us ran to get some water and we gave the others wet towels and clothes to put over their faces." At least three different gases were used: mustard gas, nerve gas and something that made people crazy (they tore off their clothes, laughed for a while and then dropped dead). Around 8000 died immediately. Even after the massacre the Peshmargan would not let people leave. They looted homes and raped women. After a week or so, many people went blind or insane. Many just gave up the will to live. Many thousands of survivors ended up in refugee camps in Iran where they are not allowed any contact with the Iranian population. The CP still has some support amongst the refugees but when the Peshmargan came to the camps to try to recruit they were chased out with stones. Camps are run like the military. Everything organised in such a way that people cannot have contact with each other. If you don't stay in your allocated place you run the risk of being locked up without food. Special passes are required for leaving the camps. These are very difficult to get. We are still conscripts. All those born between 1945 and 1970 join the army, the rest go to the reserve army. If an Iraqi soldier is killed in a particular area, the state orders the flattening of a number of houses, and executes 5 or 6 young people in public as a warning. Many people from Halabja with no relatives in Baghdad or Suliamarxia were sent to "empty zones" near the border with Saudi Arabia. Escape from these zones is impossible because you die of thirst before reaching the nearest town. The Iraqi government has started to rebuild Halabja. They intend to bring more people from Arab villages in the South to Halabja. These were people who also fought the state during the war. A short essay on the left opposition in the Bolshevik Party in Russia from 1919 to 1927, focusing mostly on the Democratic Centralists and the Workers Opposition.